It would be easy to sit here and take cheap potshots at the trailer for the "Footloose" remake, but the fact is, the clip suggests a movie that is succeeds in bringing the 1984 original starring Kevin Bacon. This new version stars dance-movie veteran Kenny Wormald ("You Got Served," "Center Stage: Turn It Up") and two-time "Dancing With the Stars" champ Julianne Hough, and was directed by Craig Brewer, he of "Hustle & Flow" fame. A much younger colleague watching the trailer over our shoulder asked if the original wasn't widely panned when it came out, and was stunned when it was explained to her how HUGE both the film and soundtrack were. But wasn't it bad, she asked, to which we responded, "It's a movie about kids in a small town where it's illegal for kids to dance--what did you expect, 'Citizen Kane'?" 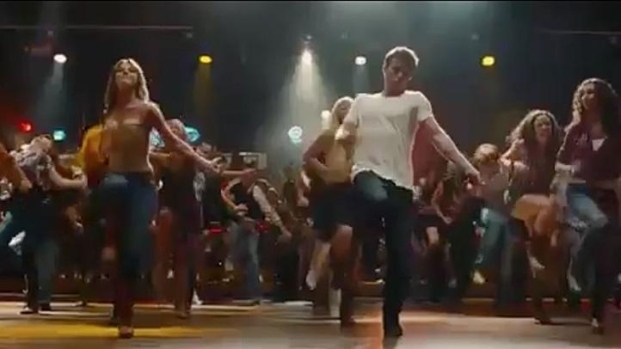 Kenny Wormald and Julianne Hough star in the remake of the Kevin Bacon classic about an outsider who falls for the local preacher's kid and goes to war against a small town's ban on dancing teenagers. Opens Oct. 14.